How do new environmental laws affect people’s daily life? In 1983 many of the seabird breeding spots along the coast of Finnmark in Northern Norway became nature reserves. Before 1983, people would pick seabird eggs as an important source of food and delicacies. The new law made most egg harvesting illegal. What do the local people think about this? 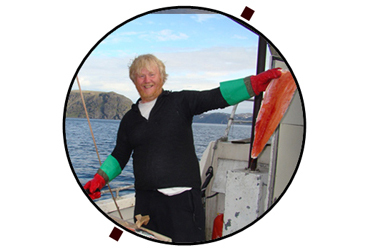 Gjesvær fisherman Kjell Ove Jensen remembers the time when they could pick eggs from the top shelf: The Auk eggs are terrific. The Guillemot, Razorbill and Puffin eggs are small and tasty. Since the wild egg shell is full of lime it comes off easier than normal egg. Even some years before Gjesværstappan became a nature reserve it was not legal to pick these eggs. ”I think egg harvesting wasn’t all bad,” says Jensen. Half the eggs we picked in the early spring were damaged by the cold (”kaldstrøppen”). When we boiled these eggs they were nothing but water. So, when we picked these eggs the birds did not have to waste their time on eggs that most likely wouldn’t hatch anyway. They had to lay another egg – an egg that had a better chance of surviving. In order to allow the young bird to grow strong for the winter migration, we stopped picking eggs at a certain point. We also tried to help the Guillemot to our mutual benefit. We would throw away nests belonging to Cormorants and Ravens to make room for the Guillemot. I never saw a Guillemot trying to defend its nest, so it is among the weakest breeders. As long as we picked eggs, the White-tailed Eagle was a rare sight. Lately and illustrious, the Eagle is partly responsible for the rapid decline in number of Kittiwakes. In 1983, the Kittiwake was everywhere. We thought the Kittiwake would settle major portions of the Gjesværstappan. Jensen is still looking forward to each spring. ”It is a fantastic time of the year when the birds return to Gjesværstappan. The ocean is sizzling with birds”. He is still eating wild eggs, however, now his favorite is Herring gull eggs. Have you visited any of the amazing seabird breeding places along the coast of Northern Norway? Youre so cool! I dont suppose Ive read anything like this just before. So nice to uncover somebody with some original thoughts on this subject. realy thank you for starting this up. this web-site is something that’s required on the internet, a person with a little originality. beneficial job for bringing something new to the web!